❈ The actual air bags in the vehicle may differ from the illustration. The side impact air bags do not only deploy on the side of the impact but also on the opposite side. 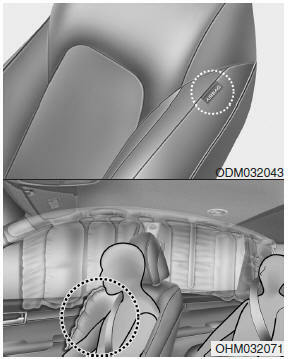 The side and/or curtain airbags on both sides of the vehicle may deploy if a rollover or possible rollover is detected. Do not allow the passengers to lean their heads or bodies onto doors, put their arms on the doors, stretch their arms out of the window, or place objects between the doors and passengers when they are seated on seats equipped with side and/or curtain air bags. The side impact air bag is supplemental to the driver's and the passenger's seat belt systems and is not a substitute for them. Therefore your seat belts must be worn at all times while the vehicle is in motion. The air bags deploy only in certain side impact conditions severe enough to cause significant injury to the vehicle occupants. For best protection from the side impact air bag system and to avoid being injured by the deploying side impact air bag, both front seat occupants should sit in an upright position with the seat belt properly fastened. The driver's hands should be placed on the steering wheel at the 9:00 and 3:00 positions. The passenger's arms and hands should be placed on their laps. Do not use any accessory seat covers. Use of seat covers could reduce or prevent the effectiveness of the system. Do not install any accessories on the side or near the side air bag. Do not place any objects over the air bag or between the air bag and yourself. Do not place any objects (an umbrella, bag, etc.) between the front door and the front seat. Such objects may become dangerous projectiles and cause injury if the supplemental side air bag inflates. To prevent unexpected deployment of the side impact air bag that may result in personal injury, avoid impact to the side impact sensor when the ignition switch is on. If the seat or seat cover is damaged, have the vehicle checked and repaired by an authorized HYUNDAI dealer because your vehicle is equipped with side impact air bags and an occupant classification system.